This is the story of the Amalgamated Society of Woodworkers, including the Amalgamated Society of Carpenters and Joiners. The Amalgamated Society of Carpenters and Joiners was one of the largest and most important trade unions of the Victorian era – and in its general secretary, Robert Applegarth, it was led by perhaps the most influential union leader of the entire Victorian era. 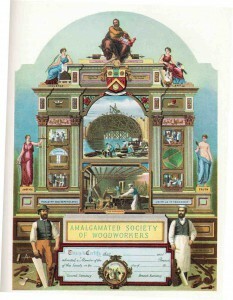 Membership certificate for the Amalgamated Society of Woodworkers. The model for the bearded carpenter was James Blayne,chairman of the ASC&J executive in 1862 and secretary of Camden Town Branch from 1866. Blayne joined the union in August 1859 and died in 1902. The ASC&J was formed on 4 June 1860 when several small London trade clubs combined in response to a series of trade disputes during which they had defeatedf attempts to introduce “The Document” (a signed promise not to take part in trade union activity). The union’s first secretary was J.Lea (succeeded by Applegarth in 1862), and membership grew rapidly, from 618 initially to 17,764 by 1880 and again to 37,588 by 1892, when it employed six full-time organisers. 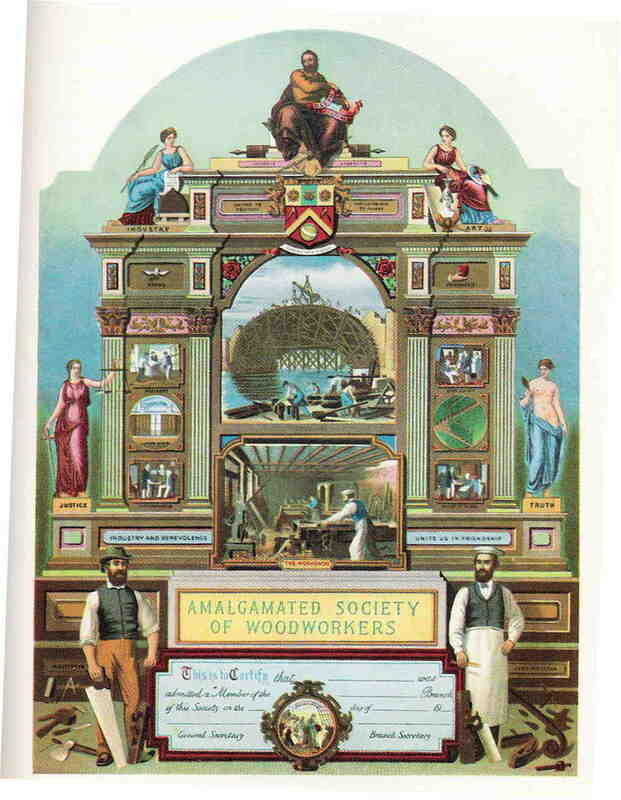 A series of small mergers followed, leading in 1921 when the ASC&J was joined by its rival, the General Union of Carpenters and Joiners, to the formation of the Amalgamated Society of Woodworkers. The ASW in turn was merge with the Amalgamated Society of Painters and Decorators in 1970 – and would form the basis of the Union of Construction, Allied Trades and Technicians in 1971 when it joined forces with the Amalgamated Union of Building Trades Workers. During his period of office, from 1862-71, Robert Applegarth increased the membership of the ASC&J from 1,000 to 10,000 in the space of just eight years, but he was equally effective in making the union a significant force in the wider world (acting alongside the leaders of the engineers, ironfounders and others as a member of the “junta” which effectively set the direction of the movement in the days before the TUC). Most importantly, however, he influenced the attitude of government towards trade unions and helped to establish a legal basis for the unions. After the “Sheffield Outrages” of 1867 in which local trade union leaders were alleged to have used arson and murder to further their cause, the Conservative government established a royal commission on trade unions. Applegarth was the union observer – using his position to brief the two pro-union commissioners, and heavily influencing their minority report. When a change of government brought the Liberals to power under William Gladstone, this minority report formed the basis of the 1871 Trade Union Act which gave trade unions immunity from prosecution for conspiracy and enabled them to register as legal bodies with protection for their funds. Applegarth’s career with the union ended badly, however. London members resented his influence and the time he spent on other issues, and when he was appointed to a royal commission on contagious diseases he was heavily censured. In the row that followed, Applegarth resigned and two rival factions fought for possession of the union’s name and assets. Applegarth’s Manchester-based faction won the day and within a year the rebel branches had given up the struggle and rejoined the union. Above: the leaders of the ASW and its predecessor unions. 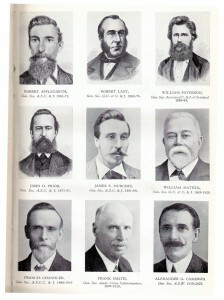 Top row (l-r): Robert Applegarth, Robert Last, William Paterson; middle row: John D Prior, James S Murchie. William Matkin; bottom row: Francis Chandler, Frank Smith, Alexander Cameron. Robert Last was born in Norwich on September 11th, 1829. He was the son of a builder in a small way of business, and after remaining at school until he was 15 years of age began work under his father. Later he was apprenticed to another Norwich builder, and on the completion of his apprenticeship in 1850 received the Norwich journeymen joiners’ wages of £1 for a week of 60 hours. In 1856 Robert Last heard of the higher wages paid in the North and in that year migrated with his wife and family to Manchester , where he obtained employment with Messrs. Bowden, Edwards, and Foster, of Brook Street . His first connection with the General Union was in 1857, when he joined the Hulme Lodge, then meeting at the Stretford Road Inn, near All Saints’ Church, and after a short period became its secretary. In 1862 he was elected by the Manchester Lodges as the Government Corresponding Secretary for the whole society, and held that office continuously until 1876. John Damrel Prior was born on July 27th, 1840, at Bradford, in Devonshire . He was the eldest son of a Nonconformist minister, and his education was intended to prepare him to eventually qualify as a schoolmaster. Having a natural bent for mechanics, at his own request he was apprenticed, in 1854, to a firm of carpenters and joiners, at Plymouth . Quite early he interested himself in associations for the benefit of the working class, and soon after he had finished his time was appointed secretary to the local lodge of the Manchester Unity of the Independent Order of Oddfellows. In 1862 the need for organisation was realised in the Plymouth building trade, where Br. Prior became active in forming a local joiners’ society, which the following year was merged.” in the A.S.C. & J. Following organisation and sense of duty came demands ­for improved conditions, which the Plymouth and district building trades employers met with a lockout. Br. Prior was an active member of the lockout committee, and when, after a period of truce, the: employers resorted to their lockout weapon again, he was elected as secretary of the committee. His reputation as a capable and energetic: leader was ripened by his handling of this dispute, leading later too his election as a member of the General Council of the A.S.C. & J. When Br. Prior removed to London in search of work he established the Islington Branch, thus coming within the radius stipulated by rule to qualify for the E.C., and was soon elected as a member or that body. Br. Prior, like Robert Applegarth, recognised that trade-unionism alone could not free the working class. He was active in various political and social movements, being sent in 1865 as a delegate by the Plymouth Branch to the conference of the National :Reform League, and the next year but one being chosen by the Society of Arts as one of the artisan members of a committee to visit Paris and report on the International Exhibition there. He succeeded Applegarth as General Secretary of the A.S.C. & J. in 1871, and resigned in 1881 on being appointed as H.M. Inspector of Workshops and Factories. During the years 1883-1886 and 1888 Br. Murchie was an active: member of the Parliamentary Committee of the Trades Union Congress and acted as its chairman in 1885. He was selected to give evidence: before the Select Committee appointed by the House of Commons to inquire into the working of the Employers’ Liability Act, and made, valuable suggestions for improving that measure. Unhappily, his career was tragically terminated in 1888. For some months his health had been but indifferent, and while attending the Trades Union Congress at Bradford during the first week of September his symptoms developed dangerously, resulting in the rupturing of a blood-vessel. On September 8th he returned home and to his bed. Hemorrhage set in and on September 12 he was no more. His span of years seemed all too brief, but a man’s life is judged not by how many years he: has lived, but by what amount of useful work he has accomplished during those years, and Br. Murchie left a record of which any man might be proud. WiIliam Matkin was born at Gaythorpe, Lincolnshire , in 1845, and as was customary in those parts served his apprenticeship as a. joiner in residence with the master with whom he was indentured. When he became a journeyman he migrated to Sheffield, where he joined the G.U. in 1864; and from there to London . In the Metropolis he attached himself to Wandsworth Town Lodge and later to the London Progressive Lodge. Always active in trade union affairs, for some years he acted as the London District Secretary for the, G.U. lodges until his appointment as General Secretary in the latter ­part of 1883. This post he held continuously until his death in 1920. In 1890 he was president of the Liverpool Trades Union Congress and was elected to the Parliamentary Committee of that body. Br. Francis Chandler, born at Harrow, Middlesex, in 1849, was at 14 years of age apprenticed as a joiner at a shop in Notting Hill, London . He early realised the value of combination, and on May 17th, 1869, a few months before he reached his twentieth year, joined the Ealing Branch of the A.S.C. & J. Later, Br. Chandler transferred to Hammersmith Branch, of which in 1872 he was elected secretary, holding the office for 16 years until he was called to be the head of the society. From the first, Br. Chandler was an indefatigable worker for our organisation and played an important part in trade-unionising the London Building Industry. He represented Ealing Branch at the ” Brown Bear” meetings held in London to consider and combat demands made by the building trade employers, and had as a colleague the late Henry Broadhurst, representing the Stone Masons’ Society. In 1876 Br. Chandler succeeded Charles Matkin (brother of the late G.S. of the General Union of Carpenters and Joiners) as secretary of the London United Trades Committee, of which William Matkin was also a member at that time. During his term as secretary of the L.U.T.C., a movement was carried through to secure due notice of discharge, i.e., “grinding time,” to allow operatives time in which to gather up and put in order their tools. At that period the A.S.C. & J. had no rule against piecework, although the system was growing in. disfavour with most trade-unionists. The L.U.T.C. began an agitation about piecework and succeeded in passing a district rule for its abolition. This did not meet with the approval or support of our E.C. who, although against the system, argued that the A.S.C. & J. was not strong enough in the London district to enforce the rule and that its effect would be the victimisation of our members. We have related the story of the Manchester strike of 1877, and London played a worthy part in helping to finance this twelve months’ struggle. Upon Br. Chandler devolved the onerous work of arranging meetings for the Manchester delegates to address, and of organising shop and job collections throughout the London district. As a result between £50 and £60 a week was sent from London to Manchester each week while the strike lasted. The work described was all done by Br. Chandler during his spare time and in addition to his daily work as a joiner, and it told so seriously upon his health that when the time came for re-election of the L.U.T.C. he felt constrained to decline nomination. During 1876 Br. Chandler was elected to the G.C., attending his first meeting in Manchester while the strike was in progress, and serving on the Council continuously until his election to the General Secretaryship in 1888. For many years, since his first election in 1895, Br. Chandler served on the Parliamentary Committee of the Trades Union Congress, and was sent as a fraternal delegate in 1901 to the Annual Convention of the American Federation of Labour, held at Scranton , U.S.A. In 1894 he was elected to the Manchester Board of Guardians, and did useful work in the capacity of Poor Law Guardian for many years. The year following he was made a Justice of the Peace for the City of Manchester . Br. Chandler was the second of our General Secretaries to have the honour of being appointed a member of a Royal Commission. He will go down to posterity as one who signed the famous Minority Report of that Commission which elaborated far-reaching and drastic proposals for the remodelling of our antiquated Poor Law system. Br. Chandler relinquished the reins of office in June, 1919, at 70 years of age, having been a member of the society for 50 years-47 years of this term he had served the society uninterruptedly in an official capacity, and 30 years of it he had, as General Secretary, played a worthy part in shaping its destinies. He died on October 6th, 1937, having completed 70 years’ membership of the society. Br. Alexander Gordon Cameron was born at Oban, and served his apprenticeship as a joiner in Glasgow . Soon after he became a journeyman he migrated to London and took an active part in the affairs of the old A.S.C. & J, acting as shipping delegate from 1912 to July, 1915, when he was elected Assistant General Secretary of the society. When the post of G.S. fell vacant, Br. Cameron was elected and took up his duties as G.S. in 1919. The I.L.P. claimed a fair share of his spare time and, together with the late Brs. W. Walker ( Belfast ), and A. Gould ( Hull ), he helped to popularise the idea of Parliamentary Labour Representation among our membership. On behalf of our society he unsuccessfully contested Kirkdale (Liverpool) twice, Jarrow, and West Woo1wich, was eventually successful in winning Widnes as an I.L.P. nominee in 1929, and shared the fate of most of the Labour M.P.s in 1932. For some years he was a member of the executive of the National Labour Party, and chairman of the Labour Party Conference at Brighton in 1921. Br. Cameron was secretary of the Aircraft Committee during the war, and a member of the Government Committee appointed to inquire into the cause of industrial unrest in Scotland . He also served on the commission sent by the Labour Party to Ireland to investigate the Black and Tan outrages. Br. Cameron resigned his post as G.S. on account of ill-health in June, 1925. On January 1st, 1926, Br. Frank Wolstencroft entered on his duties as General Secretary. He was born on December 23rd, 1882, at Royton, Lancashire , and was apprenticed to a local firm of joiners and builders in 1898. Joining the Royton and Shaw Branch of the A.S.C. & J. in 1906, he at once became active in trade union work, and was chosen as the branch secretary in December, 1907. For 13 years Br. Wolstencroft ably fulfilled his local secretarial duties, until in July, 1920, he gained the post of Assistant General Secretary to the society. During the interim he acted as-secretary of the Oldham United Trades Committee of C. & J. for four years, and was elected to the Executive Council of the society in 1914. As E.C. member he did valuable work until his election as A.G.S., and his unflagging efforts at General Office made his election certain when Br. Cameron retired. In 1928 Br. Wolstencroft was elected to the General Council of the T.U.C., going as one of its fraternal delegates to the American Federation of Labour Convention held at Vancouver , B.C., Canada , in 1931. On the International Union of Woodworkers’ Executive Council, Br. Wolstencroft represented the A.S.W. until the I.U.W., in 1933, became the International Federation of Building and Woodworkers. He was present at the formation of the N.F.B.T.O., and when he was elected as a member of its General Council, was appointed as one of its representatives on the Executive Council of the International Federation of Building and Woodworkers. For a number of years he has been one of the A.S.W. representatives on the National Joint Council for the Building Industry for England and Wales . In September, 1894, the first Assistant Secretary of the A.S.C. & J., Br. Richard Day ( Manchester 2nd) commenced his duties. There were 38 candidates nominated for the post; Br. Day received 5,424 votes, the next three candidates receiving: W. Harley, 2,225; R. Spittle, 1,809; W. Apperley , 1,582. Born at Barnsley, Yorkshire , on December 24th, 1848, Br. Day was left an orphan before he reached the age of three years. At 11 years of age he had to turn out to work and tried more than one job before he was bound apprentice to the carpentry and joinery department on Earl Fitzwilliam’s estate near Sheffield . As soon as his apprenticeship was completed, Br. Day, at the age of 21 years, migrated to Manchester and obtained work at the establishment of Messrs. R. Nield and Sons. He joined the Manchester 2nd Branch of the A.S.C. & J within three weeks after his arrival in the city, and became an active working member of our society. After holding most of the branch offices Br. Day was elected B.S. in 1886, and acted in that capacity until his appointment as Assistant Secretary. During the 1877 strike he was a prominent member of the Strike Committee, visiting London and other centres to secure financial support for our members. In February, 1890, Br. Day was appointed chairman of the E.C., relinquishing that post when he became Assistant Secretary, a post he held practically until his death. Br. Day’s activities were not confined solely to his trade union work. He took part in the broader trade union movement of Manchester as a member of its Trades and Labour Council. He was also actively interested in Friendly Society work in Manchester , acting for three years as a member of the Executive Council of the Rational Sick and Burial Association and, in 1897, succeeded in gaining a seat on its Board of Management. Br. Day died on March 12th, 1923. Br. Thomas O. Williams, who succeeded Br. Wolstencroft as Assistant General Secretary on January 1st, 1927, was born in Manchester on August 1st, 1872, receiving his education at the Welsh National School , Mold, Flintshire, and the Church School of Ardwick, Manchester . He was apprenticed as a joiner at the age of 15, gaining his knowledge of the theory of his craft at the night classes of the Mechanics’ Institute, Manchester . In 1893 he joined the Manchester 4th Branch of the A.S.C. & J., soon taking an active part in its work and filling various offices in the branch. For six years he was secretary of Manchester M.C. Elected to the E.C. of the society in 1912, Br. Williams resigned that office in 1913 to take up the job of Manchester District Delegate, resigning it at the end of 1926 on his election to the post of A.G.S. Like many of our leading officers, Br. Williams played his part in the local socialist and labour movement. He figured prominently in the “Right to Work” demonstrations of 1908, and helped with the Relief Fund inaugurated by Manchester ‘s Mayor to ease the distress of the workless in the days when there was no State Unemployment Insurance Benefit. He was appointed as a J.P. for the City of Manchester in August, 1926. Br. Alfred Gould was born in Hull in 1856 and served his apprenticeship as a carpenter and joiner there. For a brief period he worked as a ship’s carpenter but found shore life more congenial, and returned to Hull to devote his spare time to trade union and social activity. In 1881 he joined the Hull 6th Branch of the A.S.C. & J., and membership to him always meant vigorous participation in the affairs of the society. 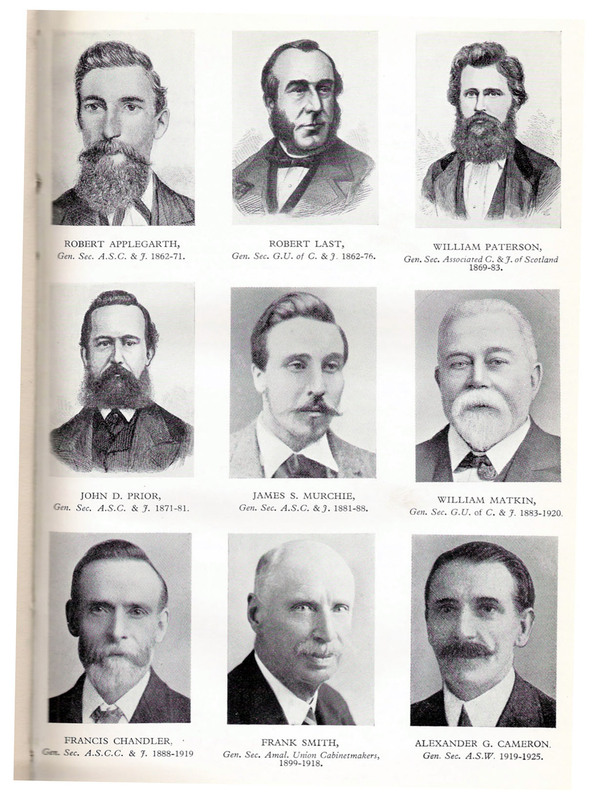 Elected to the General Council in 1897, Br. Gould was responsible for initiating many of the changes proposed by that body, serving on it continuously untiI19l7, when he resigned to seek election to the new National Executive Council, of which he became first Chairman. “Forward” was always his slogan, and right valiantly he battled on behalf of the wider trade-unionism. The Clarion scheme of federation found in him a virile advocate, and as one of the pioneers of the National Federation of Building Trades Operatives, he was elected its first .Chairman. Br. Gould was largely responsible for the trade union experiment in house-building, known as the Hull Co-operative Builders Limited and, later, he was an ardent supporter of the National Building Guild. As a member of the I.L.P., Alfred Gould secured a seat on the Hull City Council, where for many years he was to the forefront in initiating progressive measures. He was one of the first to advocate that the A.S.C. & J. should include Labour representation in its objects, and himself contested, unsuccessfully, a Hull constituency for Labour. The alteration of rule which appointed a full-time E.C. and fixed an age limit of 63 for its members, involved the retirement of Br. Gould in 1925 from active work on behalf of the society. He died suddenly on May 30th, 1927. The chairman of our Executive Council, Br. Thomas Barron, was born on April 8th, 1873, and had his upbringing in a Galloway shepherd’s cottage, and was brought to Glasgow at the age of 14 to be apprenticed to the joiners’ craft. His early trade union work was in the Glasgow North Branch of the A.S.C. & J of Scotland , which he joined immediately his apprenticeship was completed. Branch committee-man, treasurer, chairman, and member of the United Trades Committee of the “Amalgamated” and ” Associated” were among the posts he held with credit. When the seat of government of the “Associated” was transferred in 1905 from Edinburgh to Glasgow , Br. Barron became a member of its Executive Council, and was chairman from 1908 until 1911, when its fusion with the A.S.C. & J. took place. On the consequent reorganisation of the Glasgow District M.C. he was elected to that body and became first its treasurer, then secretary until 1917, when our National Executive Council was established. To it he was returned as the representative of the No 1 District ( Scotland ), and became its chairman in 1922, retiring under the age limit for officials in April, 1939. Br. Barron, realising that the weakness of trade-unionism is sectionalism, has always worked for the promotion of close relationship between the crafts of the building industry, and took an active part in the negotiations which ended in the formation of the N.F.B.T.O. in 1918. He became a member of its Emergency Committee, and was President of the Federation from 1923 to 1936. His work on the Industrial Council for the Building Trades (Building Trades Parliament), of which he was vice-president, included membership of its Education Committee, which initiated the Apprenticeship Schemes now being successfully operated in various districts, and of the Safety and Welfare Committee which drafted the regulations adopted by the Home Office, applying to woodworking machinery and scaffolding on buildings. The committee which drafted the constitution of the National Wages and Conditions Council (now the National Joint Council for the Building Industry) included Br. Barron, who became a member of the Council at its inception and was vice-president from 1923 to 1936. In 1920 he was appointed as a member of a Government Departmental Committee to inquire into the high cost of building of working-class houses, and with a colleague issued a Minority Report setting forth their own views as to the cause of the excessive cost. In 1924 Br. Barron took part in the negotiations with the Labour Government to increase the speed and volume of housebuilding, and was appointed a member of the Building Industry Committee set up under the Wheatley Scheme, becoming its vice-president. He was also on the committee of the National Housing and Town Planning Council, and an executive member of the International Housing Congress. Br. David Merson was born in Huntly, Aberdeenshire, on February 12th, 1874, where he served his apprenticeship and then migrated to Edinburgh and joined Leith 2nd Branch in 1896. Later he crossed the border and found work in Manchester . In 1911 he was elected to the Manchester M.C., was appointed its chairman in 1913, resigning the office in 1917 to take up a post as National Organiser for the A.S.C. & J. At the end of three years he was elected to the National Executive Council, and from 1922 to 1937 was on the Emergency Committee of the N.F.B.T.O., and represented the Federation on the National Conciliation Board. Br. Merson, in 1924, formed one of the joint committee that negotiated with the Labour Government for the speeding up of house building, and became a member of the National House Building Committee. From July to December, 1925, Br. Merson acted as General Secretary pro tem , and from January 1st, 1926 until December 31st, 1926, assisted the new G.S. until a new Assistant General Secretary was elected. In 1926 he represented the A.S.W. at the All-Russian Woodworkers’ Conference in Moscow . His detailed report of the conditions in Russia received at the time most favourable notice in Labour circles as well as from the capitalist Press. 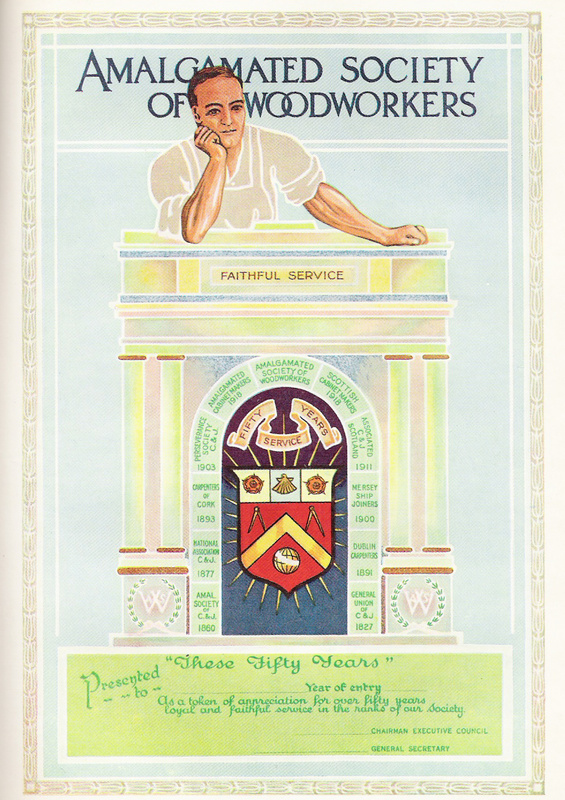 Our Society’s History, S Higenbottam (Amalgamated Society of Woodworkers, 1939). 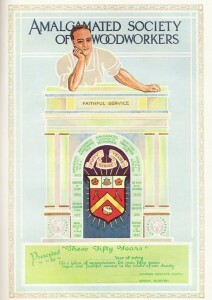 Membership records of the Amalgamated Society of Carpenters and Joiners, Modern Records Centre, Warwick University. Papers of the Amalgamated Society of Carpenters and Joiners, Modern Records Centre, Warwick University. Papers of the Amalgamated Society of Woodworkers, Modern Records Centre, Warwick University. Long-service certificate marking 50 years’ service. WALKER, H. J. (Deptford) 1918-19.